The American Dream has been central to American national identity since the country’s founding. There are many ways of defining the American Dream, but one widely used measure is the fraction of children who grow up to earn more than their parents. Our research provides new estimates of this measure for children born in 1940 through today. 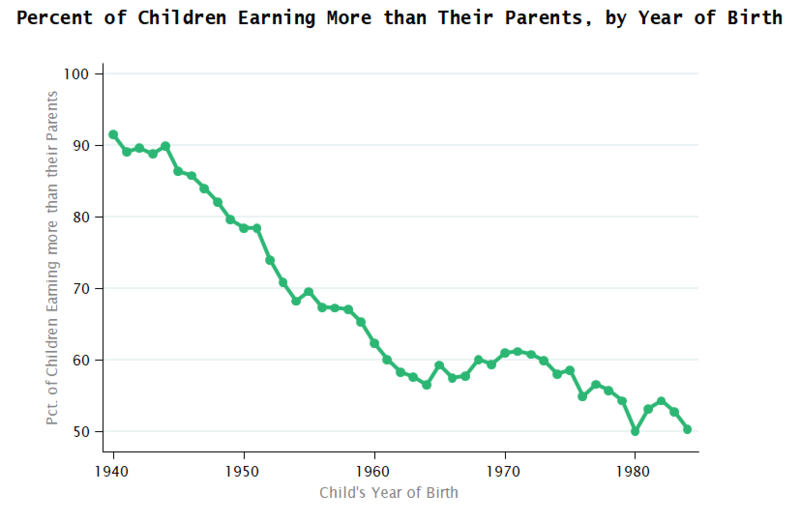 We find that more than 90% of children born in the 1940s grew up to earn more than their parents. But, over the past fifty years, this measure of the American Dream has been in decline. Today, only half of children grow up to earn more than their parents. Why have rates of upward income mobility fallen so sharply over the past half century? There have been two important macroeconomic trends that lead to this change: a reduction in aggregate growth rates and changes in the distribution of that growth. We find that the decline in absolute upward mobility is primarily driven by the latter effect: allocating the same economic growth equally would close more than two-thirds of the decline in upward mobility. What can be done to improve upward mobility in the next generation? At Opportunity Insights, we conduct research to identify areas where the American Dream is still thriving, and we harness our findings to help develop policies aimed at restoring upward mobility. We examine upward mobility through a range of lenses education, neighborhoods, and race to understand how outcomes differ across local institutions, places, and subgroups. Our research arms policymakers and civic leaders with the data necessary for evidence-based policy interventions that aim to make the American Dream a more attainable reality. Explore our downloadable library of data sets, papers, and presentations related to upward mobility.